Unfortunately — once again — it is Tuesday. True, it’s no longer Monday, and that’s nice, but most of the week lies ahead of us — if we ever get there, which feels unlikely, at this point, as Tuesday is everlasting. Surely by now it must be Thursday, you’re probably thinking. And yet — no. As the Onion most poignantly put it in 2007: “It Only Tuesday.” After this, there are still three whole days to get through before the weekend. Monday is ancient history, so you’d think it’d be at least Wednesday by now. But even now, it’s STILL Tuesday, somehow? Okay, wow. How did we let this happen again, and when will it end? Why does this particular day so unsettle us, week after week? I thought this might be a question only God could answer, but then I got in touch with Ruth Ogden, a senior lecturer in psychology at Liverpool John Moores University who studies human perception of the passage of time (!). As you may already suspect, Ogden tells me that part of the reason we’re surprised by every Tuesday has a lot to do with how we feel about Mondays. “When we’re doing lots of things, when we’re processing lots of information, we feel like more time has passed than normal,” says Ogden. For most working people, Monday is both the busiest and the most dreaded day of the week — the day to catch up on emails from over the weekend, finish the work you were meant to finish Friday, and set an agenda for the week ahead. As a result, Mondays usually feel extra long, so by the time we get to Tuesday, it’s like … Jesus Christ, it’s only Tuesday??? That seems wrong. Another major factor in our perception of time has to do with our emotions, says Ogden. The more strongly we feel our feelings (or the more “aroused” we feel, as she puts it), the more distorted our perception of time. One of the ways researchers measure this arousal is through sweat production, as in a lie-detector test, says Ogden. Given that many Mondays are as stressful as they are busy (as the two often go hand in hand), we’re even more likely to feel like they’ve lasted for ages than we are with other days. Reaching the other side of that — freaking Tuesday — and recognizing that so much of the work week remains ahead of us can only result in shock and disappointment, Ogden explains. 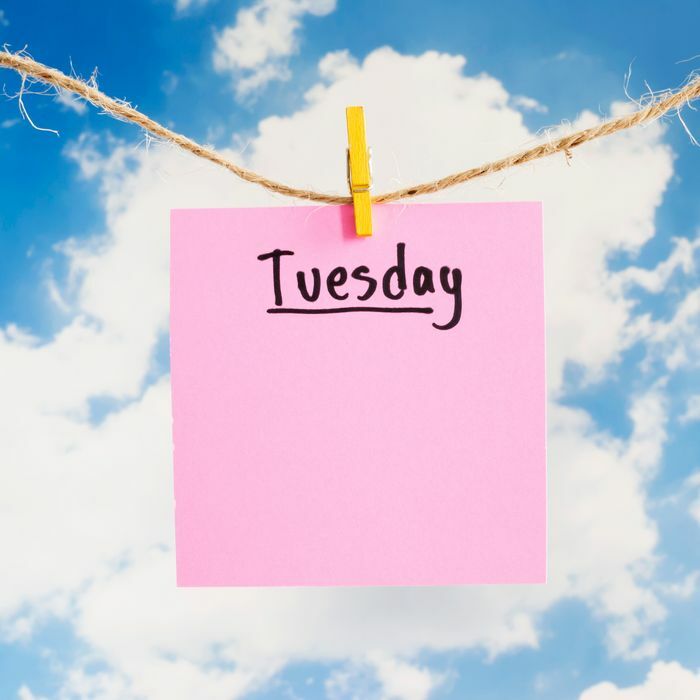 More bad news: the Tuesday problem is probably only going to get worse as we get older. “One of the things that elderly people say is that time passes more quickly as we get older, so it feels like Christmas comes around more quickly every year,” says Ogden. This might sound like a nice thing, at least if you find Christmas enjoyable. But if we compare months to the days of the week here, what is Tuesday if not February? Sure, the thing you’re looking forward to (Christmas/the weekend) flies by more and more quickly, but Februarys and Tuesdays never end. How is it possible that time keeps speeding up, and yet, on Tuesday, it stops completely? What is time, you know? Ahhhh. At this point in the conversation, I began to grow sweaty and nervous, so I asked Dr. Ogden whether there was anything to be done about Tuesdays — whether there might be a way to enjoy them for what they are, such that the rest of my life can be slowed down and appreciated. Would you believe me if I told you she suggested mindfulness? “There are some studies that show that performing mindfulness activities is beneficial, as it reduces temporal distortion, or reduces how much we feel subjective time is changing,” says Ogden. Personally, I would prefer every day to be a Tuesday over ever doing a mindfulness activity, and Ogden is sympathetic. The main thing, she says, is to relax, however that comes to you. “Do things to increase your level of relaxation and reduce the amount of activities you’re performing,” she says. In her own studies, Ogden has found that breathing very slowly produces the perception that time is moving more quickly than it really is. Still, she acknowledges, this technique may be more practical in certain situations than others; breathing slowly through relatively short, unpleasant medical procedures will probably work better than breathing slowly throughout an entire eight-hour workday, for instance. Perhaps more actionable, then, is Ogden’s suggestion to rebrand Tuesdays. She, like many people, often schedules fun things (plans with friends, movies, restaurants, etc.) toward the end of the week, under the assumption that work (and life in general) will be calmer then. But by leaving so much emptiness between the dreaded Monday and the hope of a Thursday night out on the horizon, we only augment Tuesday’s natural tendency toward barrenness. Instead, Ogden suggests that we reclaim Tuesday for ourselves — whatever that means to you. Yes, there will still be three workdays to go when it’s done, and yes, most Mondays will still be awful. But Tuesday, too, will pass — especially if you can make it worth looking forward to.